It's one of the most pleasant ways to take in the city on a warm day or evening. Some of the most memorable moments I've spent have been while enjoying a crusty loaf of bread, some cheese and fruit, and admiring a sunset over the park, or listening to the glosh-glosh of the river or canal while chatting with good friends. It's inexpensive and easy, so if you're visiting Paris on a budget, planning a couple of picnics can be a great way to save a few Euros on eating-out costs. It can offer a fun reprieve for the kids. For those of you visiting Paris with children, it can be hard to find ways to let the kids let loose, run around and get their energy out in the fresh air. The casual, relaxed atmosphere of an outdoor picnic can be an excellent outlet. On one last note: Many are confused as to whether drinking alcohol in parks, gardens, and other public spaces is legal in France. The answer, unfortunately, is that it's a blurry line. Technically it's prohibited to drink in public spaces, but in practice it's tolerated, as long as it's done moderately and no "public inebriation" results. Be discreet, be moderate, and don't make a display of yourself while enjoying a glass of rose or champagne on your picnic. And if you'd prefer not to risk the ambiguity of flouting a technical law, it might be best to eschew alcohol altogether on your picnic. Admittedly, not all of the parks and gardens in our "best of" list include the kinds of sprawling lawns that make for great picnics-- and indeed, some of them only allow picnics in designated areas (you can't sit on grass that says Pelouse en repos-- literally, "lawn resting", or Picnics interdits-- picnics forbidden. Make sure to read up carefully on the park of your choice before heading there, to avoid disappointment. Some of my personal favorites for picnics are the Romantic-style Buttes-Chaumont, the Jardin de Luxembourg, the Bois de Vincennes and Bois de Vincennes (pictured) and the mostly overlooked but lovely Parc Montsouris in the city's southern 14th arrondissement (pictured). Get those blankets ready! Let's face it: there's little that's more iconic than a lazy idyll alongside the world's most glamourous river-- especially at night, when the sunsets and shimmering play of light on the water can't be matched. Look for places to picnic along the Seine around the Ile St Louis, on the left bank near the Quai Montebello and Notre-Dame Cathedral, or further west, around the Pont des Arts. I suggest that you roam until you find a spot that grabs your imagination. But beware of late-night picnicking: after midnight, the banks can sometimes become populated by rowdy types who may have had too much to drink. Women traveling alone should especially be cautious at night and avoid areas that aren't well-populated around the Seine. 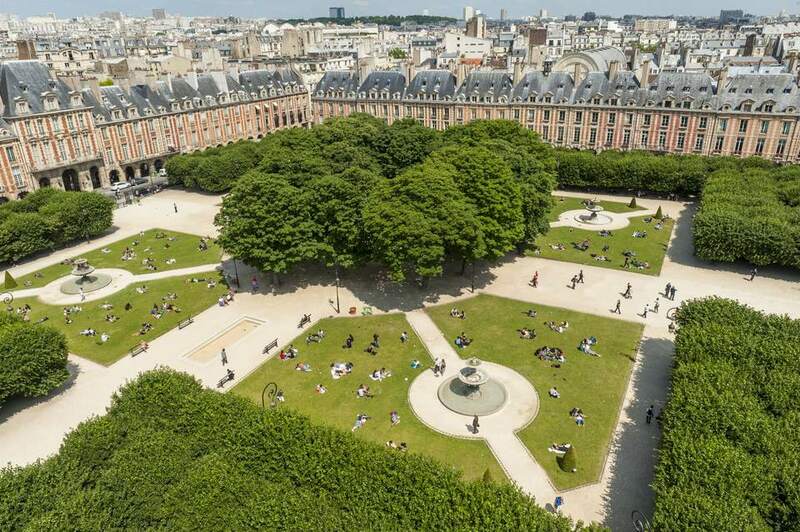 This elegant square situated in the upper reaches of the Marais district is a perfect spot to perch after a day of shopping or museum-going nearby. Picnics are allowed on the lawn. A personal favorite picnic to bring here? A falafel from the nearby Rue des Rosiers: L'as du Fallafel is the best in my book, and in many others'. A favorite area for sprawling picnics, guitar-playing and general merriment among the city's young urban hipster contingent, the Canal St Martin offers a grittier and less cliche spot for picnics. My suggestion? Order a pizza from the nearby Pink Flamingo pizzeria (67 rue Bichat, Tel: +33(0)142 023 170), and they'll deliver the pizza (delicious, especially the simple Margerita) to your chosen spot on the canal, finding you with the aid of a pink balloon that they give you in advance.